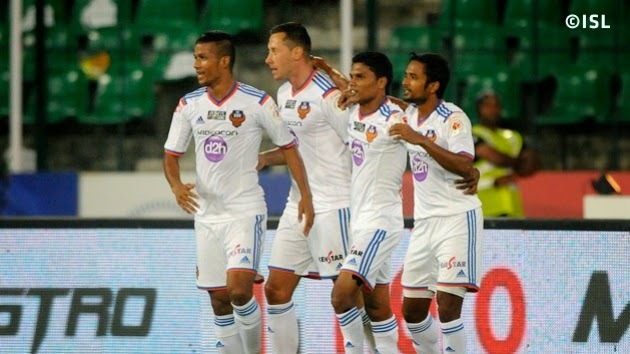 FC Goa completed an impressive victory over Chennaiyin FC to maintain their impressive winning form in the second half of the campaign. With this victory, Zico's men qualify for the knockout stage of the competition along with the home side. Chennaiyin started the first half the brighter of the two sides as they kept the ball and drove forward with purpose, controlling possession for the first fifteen minutes. As the half progressed, Zico's men began to get a foothold in the game. The defeat to the same opposition in the first match of the tournament was probably ringing in their minds. In the 24th minute, Mandar Rao Desai took an excellent left-footed shot that beat Shilton Paul and ricocheted back into play off the crossbar. Romeo Fernandes was on hand to smash home an excellent opener.